"Tyler Perry's Madea's Family Reunion," a comic drama from the creator of "Diary of a Mad Black Woman," held off a rush of new releases to maintain the top spot at the weekend box office. The Lionsgate Films movie raked in $13 million in its second weekend, bringing its gross to $48 million, according to studio estimates Sunday. It edged out the cop thriller "16 Blocks," which debuted at No. 2 with $11.7 million. The Warner Bros. film stars Bruce Willis as an NYPD detective trying to shuffle a star witness from a precinct lockup to a grand jury session 16 blocks away. Overall, it was a lackluster weekend performance for Hollywood, where attention was focused on the Academy Awards on Sunday. The top 12 movies took in $83.8 million, down 23 percent from the same weekend last year. "Not every weekend can be a blockbuster. This weekend definitely was not," said Paul Dergarabedian, president of box-office tracker Exhibitor Relations. Other new wide releases this weekend had mediocre showings. Screen Gems' sci-fi flick "Ultraviolet," starring Milla Jovovich exacting revenge on the government after being infected with a blood disease, debuted at No. 4 with $9 million. The 20th Century Fox teen mermaid tale "Aquamarine" opened at No. 5 with $7.5 million. Focus Features' star-studded comedy "Dave Chappelle's Block Party" came in at No. 7 with $6.5 million. "Madea's Family Reunion," which was shot for just $6 million, is a comic drama about a slew of domestic hijinks that occur as a family prepares for a reunion. Perry wrote and directed the film and starred in three roles including the overweight, pistol-packing matriarch Madea, whom he also played in last year's "Diary of a Mad Black Woman." Foreign-language Oscar nominee "Joyeux Noel" opened strongly in limited release, grossing $50,133 in six theaters, for a healthy $8,356 average. By comparison, "16 Blocks" averaged $4,307 in 2,706 theaters; "Ultraviolet" did $3,518 in 2,558 theaters; "Aquamarine" averaged $2,986 in 2,512 theaters and "Dave Chappelle's Block Party" did $5,430 in 1,200 theaters. 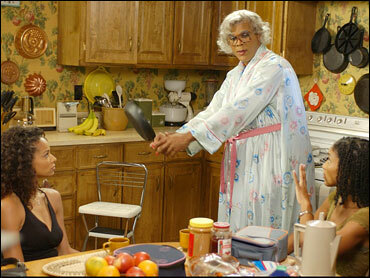 "Tyler Perry's Madea's Family Reunion," $13 million. "The Pink Panther," $7 million. "Dave Chappelle's Block Party," $6.5 million.